I can arrange for you to have permanent pacemaker implantation at Colchester Hospital, The Oaks Hospital or at The Orwell Suite in The Essex Cardiothoracic Centre. A permanent pacemaker is a device to prevent the heart going too slow. Prior to the procedure, you will have an intravenous cannula (small plastic tube) inserted into a vein in your arm. This is so we can give you antibiotics and fluids before, during or after the procedure. The nurse will also take some routine observations, eg blood pressure, and do an ECG. You will be taken into the cath-lab or operating room and asked to lie on a flat, thin bed. You will have ECG tabs put on your arms and legs and a clip put on your finger to measure the oxygen levels in your blood. Your blood pressure will be measured periodically. The skin over your upper chest will be cleaned with sterilising solution. Usually a pacemaker is fitted on the left side but I will discuss with you if it would be more appropriate to fit on the right side. You will be covered in sterile drapes. Local anaesthetic will be injected into the skin between your collar bone and shoulder. This will sting and then go numb. You should not feel anything other than some pressure after this. A cut will be make about 1½-2″ long in this area and space made under the skin for the pacemaker. One or two leads will be passed into a vein under your collar bone. These will travel down into your heart and be positioned in the correct place with an x-ray camera to guide. Once they are in the correct place, the leads will be tested by a cardiac physiologist to ensure good contact is made. You may be asked to breath in or cough to check they don’t move. After this check, the leads are sewn in place to the back of the little pocket the pacemaker will sit in, under the skin. The leads will be connected to the pacemaker and the device tucked into the pocket. The skin will then be sewn back up. Before a pacemaker it is usual for us to check that your kidney function is normal and that you are not anaemic — if you have not recently had blood tests to check this then you will need these simple blood tests taken in the days leading up to your pacemaker. You will also need two skin swabs to check you don’t have the skin infection “MRSA” — the nurses at the Oaks hospital can arrange this and some GPs offer this service. I don’t insist on you being starved in preparation for the pacemaker but you should not have a large meal beforehand. 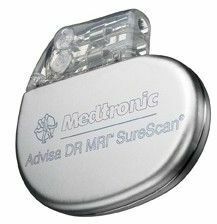 It is very important that you take all your usually medication on the day of the pacemaker unless you are given specific advice by the pre-assessment team. Implantation of a pacemaker is done as a day case procedure. The actual procedure usually takes from 40 to 60 minutes to do. The recovery and monitoring period in the ward after can take a few hours (see next section). You go to the recovery ward. The nurses will keep an eye on your wound and you can have something to eat. If you need any medication, the nurses can help you with this. They will watch your pulse and blood pressure regularly. You may need to have a chest x-ray before going home — you will be told if this is required. The cardiac physiologist will check the device again on the ward with their programmer — this is done with wireless technology. After the procedure, the nurses can usually give you an approximate time that you will be fit to go home. They can telephone someone to arrange for you to be picked up. You should not go home alone and you should not drive home. Depending on why the pacemaker was fitted, there may be variable restrictions on when you will next be able to drive — please ask for advise. You will need to inform the DVLA that you have had a pacemaker fitted and take their recommendations over when you can drive also — often the DVLA will contact me to get more information but if the situation is straight-forward, they won’t usually wait for my reply to determine if and when you can drive. You will only need to stay in overnight if you do not have someone at home with you that night (or cannot stay with someone). If you have the procedure at Colchester General, I can arrange an overnight bed at The Oaks and transport to get you there. If you have the procedure at The Essex Cardiothoracic Centre, you can stay over in the Orwell Suite private ward. You will be invited back for a check at the device clinic in about 4-6 weeks and they will go over things with you again. Some patients choose to have ongoing monitoring done remotely over the phone rather than have to visit the clinic each time — you can discuss this with the physiologists and make your own choice. The amount of x-rays used to implant a pacemaker is very small compared with many x-ray tests and therefore has no clinically important risk. The commonest problem is some bruising around the wound. My complications rates are very low and I work closely with my team at Colchester to constantly monitor and improve the patient experience. All cardiologist’s complications rates for pacemakers are now submitted for national audit; however they have yet to be published this year. A pacemaker watches your heart rate and if it is too slow, it will make your heart beat faster — you will not actually be aware of this. Most patients are just aware that they are no longer feeling dizzy or blacking out! Some people are fitted with a pacemaker even if they feel normal as a preventative measure — you will therefore not feel any better but will have the reassurance that your heart won’t become dangerously slow in the future. Other patients are fitted with a pacemaker because their heart goes sometimes too fast and sometimes too slow and the pacemaker will allow them to go on stronger medication to slow the heart without making it too slow. This strategy helps reduce palpitations.